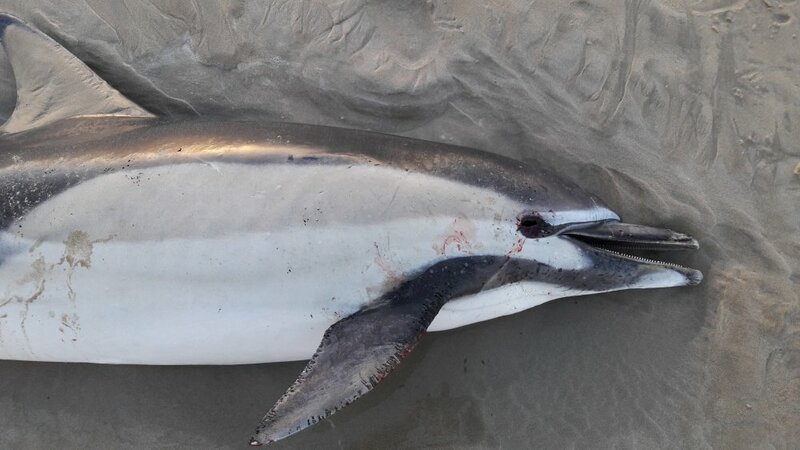 IWDG have received a letter from Minister for Arts, Heritage, Regional, Rural and Gaeltacht Affairs, Heather Humphreys following our concern regarding increased strandings, especially of common dolphins. In the letter the Minister states that "the Department have a robust programme of scientific monitoring in place for all species including extensive offshore surveys".She acknowledges the work of the IWDG and their provision of 10,000 per annum towards the Stranding scheme. In response to establishing the cause of death of strandings, the Minister states " as you will be aware most cetacean mortality in the open sea is due to natural cause. There are some interactions with human activities, such as fishing, that are also documented by the (stranding) schemre and monitored by the Department. In cases of exceptional stranding events, the Department has commissioned post-mortem examinations of animals to better understand the causes of mortality. The Department will continue to work with its Government partners on these issues". IWDG sugests monitoring should solicit a response or action if it shows "unusual" events or unacceptable trends. Years ago we recommended a "trigger" be agreed which led to a response such as recovering animals for post-mortem if stranding numbers of patterns hit a certain threshold. Unfortunately the Department seem to be content in monitoring but not acting upon the evidence from this monitoring. IWDG will continue to push for a properly resourced post-mortem programme to establish the evidence behind causes of death of dolphins and other cetacean species in Ireland. There has been much interest both in ‘traditional’ media (newspapers, radio etc.) and in social media in the results presented by the IWDG showing the large increase in reported strandings (and we continue to point out that these number may be only a small percentage of actual common dolphin deaths) but what now? Based on other years, it is difficult not to be somewhat cynical and think that the number stranding will ease off, attention will focus elsewhere and we’ll be back here with the same story in 2017. This is simply not acceptable and action must be taken. Little did we think that the situation would not just be as bad but actually worse. So far this year, 56 cetacean strandings have been recorded with 29 (52%) of these identified as common dolphins. Previously, 2013 had the highest number of strandings early in the year with 48 records to 17 Feb of which 28 (58%) were common dolphins. In the years prior to 2010, average numbers of strandings at this time of year were around 22 of which 5 would have been common dolphins. During the week, IWDG met with stakeholders from government agencies and representatives from the Irish and foreign registered fishing fleets in an effort to work out what exactly is happening to cause such changes at this time of year. There is a disconnect somewhere as internationally accepted visual evidence of bycatch is seen in some strandings, and post mortem reports on 5 common dolphins in Mayo in 2013 reported that their deaths were likely to be due to bycatch in a pelagic trawl net - yet Irish and EU observer schemes involving pelagic trawlers reported no bycatch in commercial pelagic hauls. As I sit here by the desk, I can't help but feeling like I'm in a movie - unfortunately for dolphins in Ireland, the movie in question is Groundhog Day, because last year feels like yesterday, watching a steady stream of dead dolphin reports and thinking "will I be sitting here this time next year watching the same thing?". Unfortunately, the answer is no because at 42, total strandings to 6 February 2017 are around 30% higher than 2016 and are second highest on record with only 2013 being higher (45). As has been the case since 2013, the biggest losers are common dolphins and one would have to start wondering at what stage they may become 'uncommon' dolphins. Up to 2011, we would have expected between one and seven common dolphin strandings in the first five weeks of the year but in 2013 the figure was 27 and in 2017 stands at 22. What we must keep stressing is that this is only a figure for recorded strandings, not including those that never wash ashore or go unreported despite stranding. One study suggests that as little as 8% of dolphins dying at sea are actually recorded. Before 2011, the highest annual total of recorded strandings of cetaceans in Ireland was 147 but this has risen to between 176 and 219 over the last five years. So, the obvious question is why? And the rather pathetic answer is, we don't know, even though this has been an annual occurrence for the last five years or so. There is no doubt in our minds that fisheries bycatch related to offshore pelagic trawling in winter/early spring has a part to play. Post mortem results from Co. Mayo in 2013 when there was an unusually high number of dead common dolphins washed ashore, confirmed that deaths were consistent with fisheries bycatch. 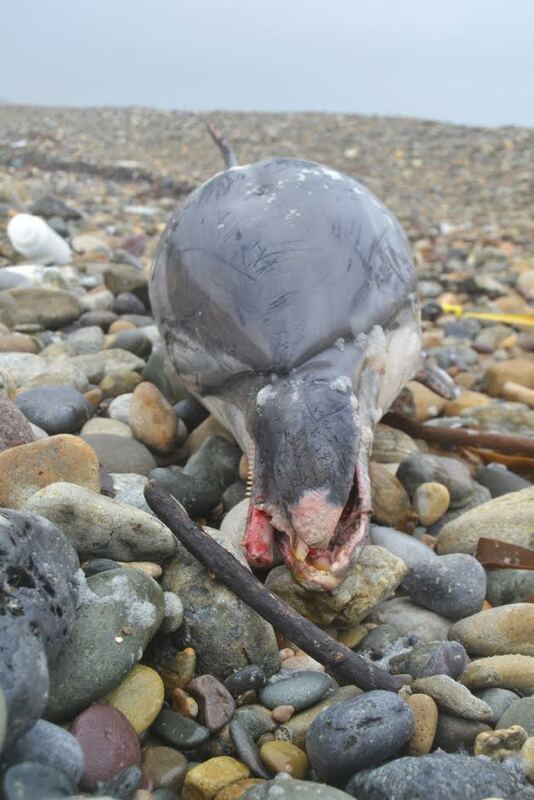 Also, injury and damage to some carcasses is consistent with bycatch eg broken beak as in the picture above and this is coincidental with a large fishing effort by various countries in the waters around Ireland at this time of year. IWDG accept that there is a 'normal' level of strandings from various causes ie sickness, injury, old age etc but we are concerned at the increase in strandings over the last five years and the apparent lack of determination to establish the cause(s) in what is, if nothing else, a legally protected species. Several recent live and dead strandings also show signs of emaciation but is this due to illness or lack of food? Until there is a scheme in place in Ireland to post mortem freshly dead cetaceans with a view to establishing the cause of death, it is impossible to adequately protect these animals because without knowing the 'why', little else is possible. If you establish causes of death then, for example, you learn if it is worthwhile to refloat live stranded animals. Likewise, if you learn the impact and extent of interaction with different types of fisheries, only then can you look at putting workable mitigation measures into effect. In a way, perhaps the biggest threat to cetaceans in Ireland is not what people are doing, but what people are not doing. It's surely time to stop just ticking boxes and start trying to figure out what the actual problems are.